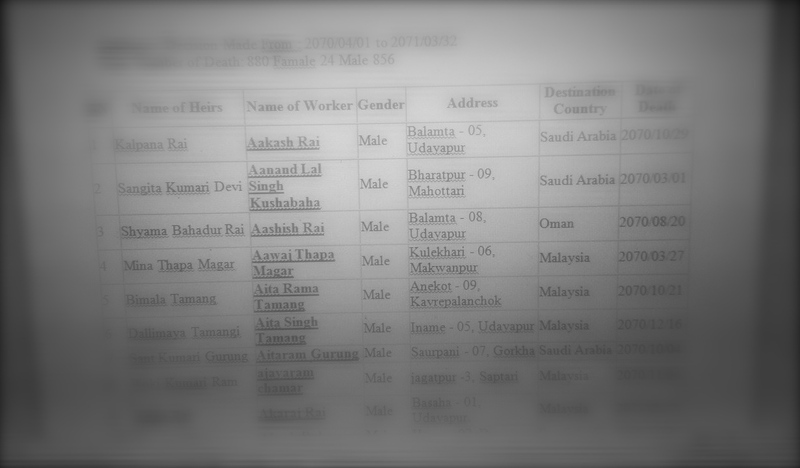 Since the day I arrived in Nepal, I have been trying to get a list of migrant laborers who have died abroad. Partly this is so that I can find a family willing to tell me about their son’s life. And partly it’s because everybody has a different opinion on how common it is for migrant laborers to die abroad. The night I landed in Kathmandu’s national airport back in December, I spoke with an airlines agent, who told me that bodies arrive at the airport daily. Someone else milling about the office said they receive a body every few months. When I asked for a record to sort it out, they said each airline keeps a separate list, and to get a combined total of bodies received, I’d have to go to customs. A few days later I went to customs, which eventually sent me to the cargo office, which eventually sent me to an insurance company, all in search of this List. Our cousin Laxu, who was helping me, agreed to go to the insurance company while I was back in Pokhara. He texted me later saying that the insurance company had sent him to the government’s Foreign Employment Office, where families of the deceased to go pick up renumeration. On an afternoon in early January, a month after my first night at the airlines office in Tribhuvan Airport, Laxu and I went to the Foreign Employment Office. We arrived to find it closed for a holiday. There was nobody there except for a guard standing outside. The elusive List still beyond our reach, I asked the guard what he’d noticed about families coming to deal with the legalities of a loved one who’d died abroad. He said the families are easy to recognize. They come regularly. Usually, the guard told us, the immediate family of the deceased arrives with someone who can help navigate the system and explain things. This is something I’ve heard a lot. The families of many migrant laborers are minimally educated and have little experience outside their home villages or communities. Handling the logistics of a death is complicated under the best of circumstances, and for many of these families, it is impossible without someone to help with things as simple as travel and reading. I asked how people normally transport the body of their loved one home to perform rites. This is one of the central my questions of this project, because transporting bodies around is so starkly incompatible with the traditional ritual treatment of the sacred dead body. And, it’s expensive. It’s important to understand who pays to make kriya possible by getting everyone in the right place. Is the labor industry involved in supporting the families of workers who die overseas? Is it the government of Nepal? Do poor families have to sort this out themselves? “It’s the government that pays for transport back to villages, not the manpower companies,” the guard told us. Everyone I’ve talked to so far flatly disagrees on this point, so the truth is, it probably varies from company to company. He went on to explain in general terms that when laborers arrange their own jobs abroad, they are unaccounted for – even by the Nepali government. If anything unfortunate happens, it is much harder for freelance laborers to get home, or even for them to be identified. Their families, in all likelihood, would have no way to trace them. So the only way to do it is through a manpower company, because stacked insurance is a lot better than none. 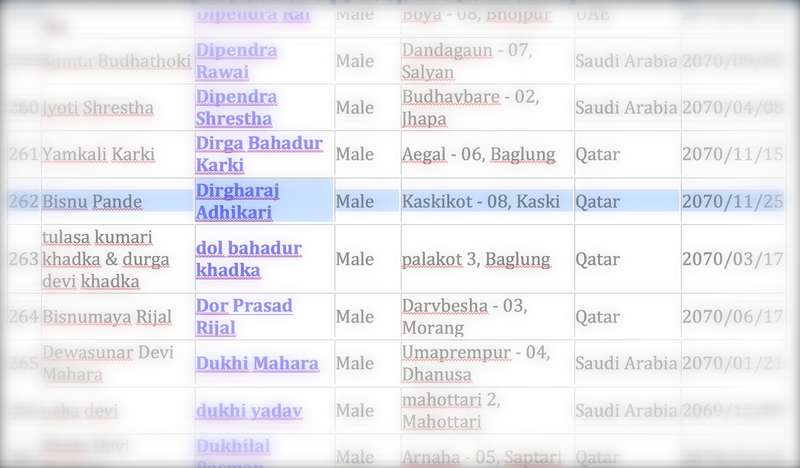 It was clear that Laxu was going to have to come back another day to get The List. Before we left, I asked the guard how many families he thinks come to the Foreign Employment Office each day to receive insurance payments. Eh, they come, he said, they come. We went back and forth a few times; I thought he was being vague because it wasn’t all that often, and our conversation was overdue to end. Then he looked straight at me. The night I arrived in Kathmandu from the U.S., I recorded a midnight interview with an airlines agent. When the interview ended, Laxu and I asked for a record of bodies received at the airport, for two reasons: one, we need a better estimate of numbers, and two, I am looking for a family I can spend some time getting to know. The agent told us each airline keeps separate lists of bodies it receives, so if we wanted a combined list, we’d have to go to the customs office. Two days later, Laxu and I returned to the airport to visit the customs office. A police officer outside told us we needed permission from customer information to enter the airport. Customer information sent us back to the police officer. We went back and forth until the officer took us inside, where four guards told us we could not talk to customs without permission from the government, and then said the list we were looking for was in the cargo office, not the customs office. We hailed a cab to the cargo office. A security guard looked at my ID, told me not to record or take any photos, and opened the gate to the cargo office. At last, Laxu and I entered a cavernous hangar filled with endless towering stacks of packages and containers. I was alarmed to find myself scanning the warehouse for casket-sized boxes, and willed myself to stop, but I couldn’t help it. It seemed the search for The List, which had started so simply in the airlines office, would never end. Laxu and I wound our way from office to office in the cargo hangar, being bounced from one official to another. At last we entered a third-floor room at the end of of a long hall, lined with rows and rows of dusty files, harboring a single employee who looked like he did not often get visits. Being in this room of papers felt oddly momentous. Somewhere in these weary stacks was a document that would turn this warehouse into a list of people who had lives, families, stories, names. Nope. The single employee informed us that before he could give us any records, we would have to get permission from “The Chief.” He sent us down another hallway. Outside The Chief’s office, Laxu and I sat in a gigantic waiting room that contained nothing but one desk, somewhat reminiscent of the Oval Office, and two women sitting on a low windowsill, starting absently out at the parking lot. An empty teacup sat on the windowsill. The women told us to wait, so we waited. And waited. “If you’re able to get permission,” one of the women said during a random moment of waiting, “it will still take quite some time to get The List.” But why? I whispered to Laxu. We had just been in a room with nothing but lists and a person who seemed to have very little to do. We entered The Chief’s office. Sitting before him like children summoned before the school principal, we asked permission to go back to the first room and get The List. The Chief replied that the cargo office doesn’t keep a separate list of laborers. It records all bodies that arrive from overseas each day, on average three to four, he estimated, including people who die overseas for any variety of reasons. To get a list of laborers, he suggested we go to the insurance office. Wherever that was. For a moment we simply sat there. It had been such an effort to arrive, this seemed like too short an answer. I suddenly thought to ask if The Chief would mind telling us: what happens when bodies arrive in this cargo hangar? “Everyone,” said The Chief, “is processed in ten to fifteen minutes. Maximum.” He repeated “maximum” a few times. I asked if I could record our conversation, and The Chief said, absolutely not. However, he added, leaning back in to his chair, he had recently done an hour-long interview on an important radio program. Could he tell us, then, who comes to retrieve people who have died abroad here at the cargo office? What clothes are the families wearing? What kind of transport do they use? And where do they go when they leave here? After all, there are no provisions for this situation—bodies are not meant to be in airports. Some families, The Chief said, have a long way to go back to their villages to conduct rites, and they come in plain clothes with a hearse. 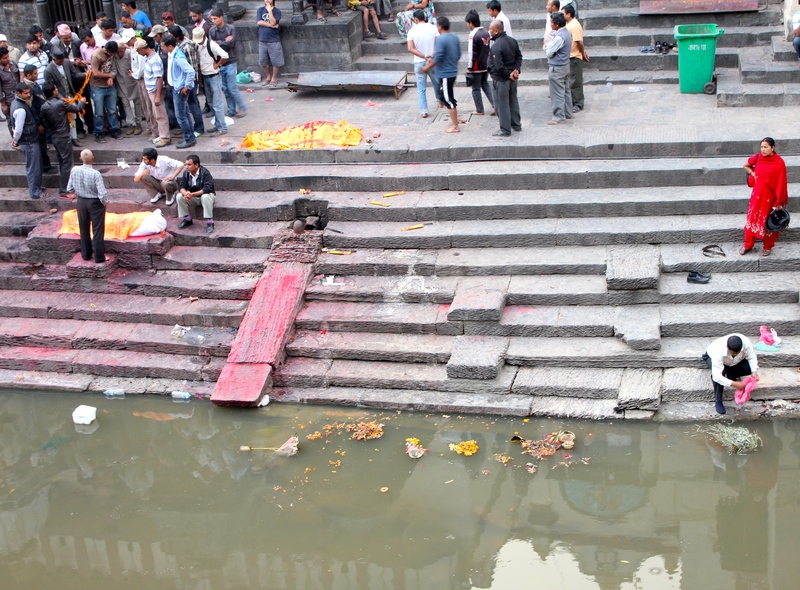 But some do the rites here in Kathmandu at Pashupathi or Boudanath or Swayambhu, and they might arrive in a procession. I looked out the window at the same parking lot the women in the waiting room had been staring at and thought of it filled with a funeral procession. Oddly enough, weeks after this interview, it’s the view of the parking lot from the Chief’s office that still floats in unbidden into my thoughts. “We don’t enforce a rigid protocol,” the Chief said, which, I’ve thought since, was a strange and pregnant detail. I tried to press for more particulars. What has he noticed about which of the deceased are treated in what way? Ten to fifteen minutes. Maximum. In the West we’re accustomed to the idea of bodies being transported around for and by people who know what to do with them. But what about the white curtain that covered Shaula dai? 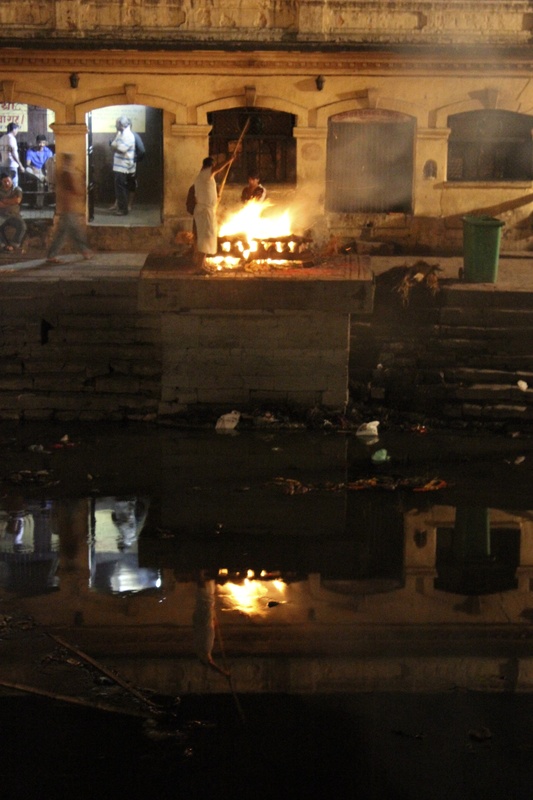 Or the night I sat at Pashupathi Nath and watched a son put fire in the sacred mouth of his parent? Or when our neighbor Maina bouju passed away in Kaskikot, and Bishnu and I went to her house and sat with her family as they kept vigil over her head and feet until morning, when her sons dressed her and lifted her on to a bamboo gurney balanced on their shoulders, and I was transfixed by how Maina bouju’s covered head was so close to her son’s face that they brushed against each other as he carried her all the way down from the ridge to the river in his white clothes. What about that? 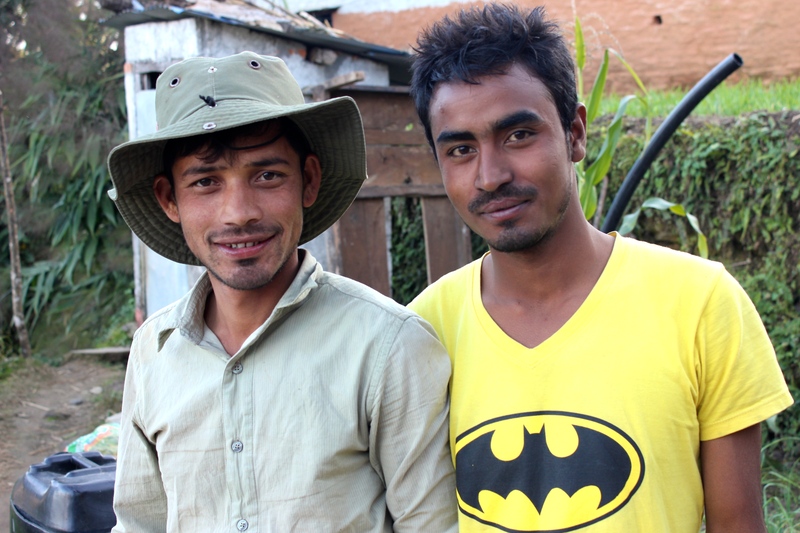 Mahendra and Madu are two of the first boys I ever met in Kaskikot. They grew up in the houses on either side of us, and when I first arrived in 2002, Mahendra was about 13 and Madu was 11. Mahendra has the chiseled features and doe eyes of a movie star and the athletic, wiry frame of a boy who is too restless for his environment. As a teenager, when all the kids built swings for the festival of Dashain, Mahendra would climb a towering stalk of bamboo like a monkey and fix the rope at the top while hanging horizontally, high above the ground. If Mahendra had grown up in the U.S., he would have been the star of the high school soccer team who smokes pot and can be counted on for a party when the parents are out. He’d always hated being born poor in this bottomed out village, even from the time he was very young. It bored the hell out if him and insulted his power. He was meant to be dangerous and to cut his teeth on anything but here. Madu on the other hand was a gentle, slender boy with a soft voice and midnight skin. I often used to sit in his house in the evenings while his mother brewed moonshine to sell for a few dollars. Like Mahendra, Madu dropped out of high school before he graduated, and signed up with a manpower company when he was about 16. Before he left, Mahendra married and left behind a pregnant wife. Madu’s older brother Jivan left; then Madu left. So many of the boys in this village are like Madu and Mahendra. For the first few years I was coming to Kaskikot, we spent a lot of time together working in the fields, carrying loads, pounding and climbing and chopping and joking in the yard over tea. There was a posse of them that used to wander out at dusk after the work was done, to play soccer or roam or plan the future. Sometimes I would hear Barat playing his flute on the other side of the hill, where the posse used to hang out in his yard. Then they started disappearing. Malaysia, Saudi Arabia, Qatar, Dubai. Madu’s house gained a TV and a new room, and Mahendra’s mud house, like many others, was rebuilt with cinderblocks. Large swaths of the hillside turned year by year from fertile to uncultivated land. One home after another became inhabited only by old people. Last Monday night I arrived in Kaskikot for the twelfth year in a row. The next morning when I got up, Madu came over and sat in the yard talking with me for half an hour. He was wearing a faux-leather jacket and shoes. He has been working at a noodle factory in Malaysia for three years, first sealing spice packets, then as a line manager. It started off bad: the overtime they were promised not paid, the meals they were promised not provided, the roommate who ate dinner, went to bed, and then didn’t wake up the next morning for a reason nobody knows. Everyone was afraid to touch him, this body that at home would have been sacred. Once Madu got promoted, his salary doubled and it was better. Most of them, he admitted, don’t promoted. I went to fetch water at the tap. I passed Barat’s yard and the whole posse was there. All home from their various countries this winter. Most of them married. Leaning carelessly against the wall, sitting with an arm angled across a knee, laughing at a private amusement, hair greased and shining in the morning sun. Mahendra looked as glamorously bored as ever, but he did light up – to the extent he does – to see me. I asked what they’re all doing now. The answer: waiting for new visas. Last night I arrived in Nepal on a flight from Dubai. It was nearly 11pm by the time I got through immigration and came out of the airport to meet our cousin Laxu. As the baggage came bouncing on to the conveyer belt, dozens of televisions swirled by . It was a funny moment, something like hearing my own song on the radio, because in the last ten years I’ve watched televisions appearing in one house after another Kaskikot. Next door at Saano Didi’s house, where Jivan and Madu have been working abroad for a few years now, they now have TWO televisions. It is the single most reliable status symbol of a household with a family member working abroad, and for some reason it strikes me as funny that people actually bring the televisions back with them, rather than just purchasing TVs in Nepal after they get home. Like many aspects of this whole system, it’s a thing. It’s the ritual. Before I left the airport, I decided should try to get a phone number for the baggage office. The purpose of this project is to look at how traditional death rites are altered when migrant laborers die abroad, which means, first of all, talking with someone who processes bodies that are shipped home to this very airport. Since it’s unclear how I’d explain this on the phone, it seemed like a good idea to get a name and phone number for the baggage office while I was already there. I started at the baggage desk, where an agent gave me a cell phone number and a name and sent me to the airlines office building, which, oddly enough, was still open at 11pm. Laxu and I left my bags outside with his friend, and then waded through a series of muddled conversations about why we were there: with a police officer, a secretary, other people who had unclear reasons for being in the front hall of the airlines building so late at night. Eventually, we were led in to a narrow back cubicle, where we sat down at an empty desk, across from a clock that read 11:30pm. I had a feeling we’d be there a while, and probably with no result. 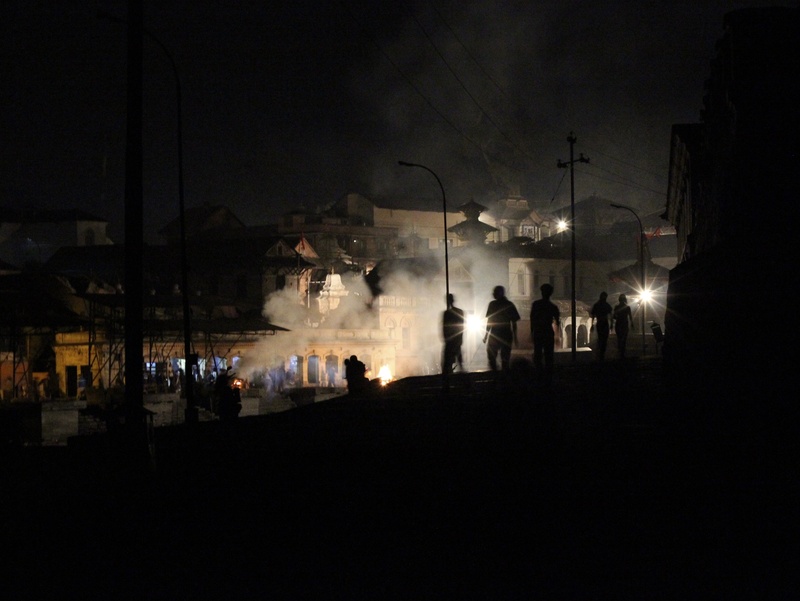 What happened next was the typical Nepal phenomenon where nothing is happening for a long time, and just when you are certain your plan hasn’t worked, something appears out of nowhere. The something was an airlines agent who did not want to be identified, but was very eager to talk to us about what it is like for him to receive and process bodies from abroad. He listed all the documents that come with bodies when they are shipped home, and the procedures for releasing them. He said it is “terrible scene” to deal with the families. He kept repeating “terrible scene.” As the clock ticked on, I was increasingly aware of the late hour and the hush outside the airport as everyone who’d been on my flight departed. The agent was especially intent on explaining the travesty of the labor system to me. Every time I directed our conversation back to the baggage procedures that in this dreadful and bizarre situation have essentially usurped sacred death rituals, the agent would find his way back to condemning the exploitative labor trade. I noticed that he insisted that the families he sees coming to retrieve their loved ones are “very poor,” “low caste,” and “uneducated.” I know this not to be true; almost every household in Kaskikot, like in so much of rural Nepal, has a young male family member abroad, and almost all of them, while poor, are educated (and high caste, while we’re at it). It’s the country that, in a global context, is colossally poor. I wondered about this trenchant misconception later. It’s easy, after all, to deplore a system that preys on wholly ignorant people. But my impression is the vast majority of Nepali laborers, while disenfranchised, are nevertheless aware of the general inequity of the migrant labor system. Like Mandira, they make the bargain with their eyes open, usually multiple times. It’s too simplistic to assume that half a million people per year are too naive to realize what a high price they are paying, and doing so avoids the more complex question: Why is it worth it? What is in it for these youth and their families? Hundreds of thousands of them? By the end of my interview in the airlines office, it was after midnight, and a crowd of employees—inexplicably still at work—had crowded in to the office to listen. Our topic had obviously struck a cord. I turned off my recorder. Laxu and I dispersed in to the eerie, deserted airport parking lot, and caught a cab home. My layover in Dubai was eight hours. Long enough to trek back and forth many times along the glaring fluorescent strip of duty free shops betwen terminals one and two. It was daytime in Dubai, but for me it was the no-time that happens during a trip from one hemisphere to another. I wandered in to one of the bathrooms and soon found myself looking for an earring that had dropped. A young employee who’d been sitting idly when I walked in came over to help me. As I was shuffling through my belongings she noticed a coin. that Mandira is 26 years old with a 1-year old baby she left in Nepal with her in-laws and her husband, who is also waiting for a visa to travel abroad. When I asked what she’d paid a manpower company to broker her position in the Dubai Airport bathroom, I already knew roughly what the answer would be: about 10,000 dinars. Her salary: 900 dinars per month. It would take her a year to pay off her loan to the company before she started earning anything to send back to her family. It will be a few more years more before she can afford the 3.5 hour flight home to see her then four-year-old child. It’s a typical story but it’s still amazing to see it in action without having to try. This kind of position has become so preferable to looking for local employment in Nepal that I don’t even have to leave the duty free section of the airport to find Mandira. The flight from Dubai to Kathmandu is a special kind of cultural experience. You step out of a hip multinational terminal in to a waiting area where almost everybody who isn’t a white person wearing hiking boots and tie-dye is a Nepali person returning home from a labor contract. For many it is the second flight of their entire lives. A large percentage of passengers have none of the practiced movement that comes with routine air travel. There’s a lot of helping each other find seats, opening and closing latches to see what they do, gazing out the window at baggage trucks, calling to one another across the rows to look at this or that. It’s about as close as you can get to walking out of an airport and getting on a city bus in Kathmandu that launches in to the air. On the plane I immediately leaned against the window and tried to sleep. I’d been traveling for 20 hours. The young man next to me was quiet and stared straight ahead, and I assumed that he, too, was an amateur passenger just surviving the journey. After an hour of half-sleeping, I sat up, and as I jostled my position, we exchanged a few words. “My father just died,” he said. I drew in my breath. “I’m so sorry,” I said. The snack cart came along. “Can I get you something?” he asked. I declined, but he asked a few more times, and I declined again. He bought a sandwich for himself. He asked the boy in the aisle seat – who didn’t look any older than 18 – what he wanted. “I’m really okay,” I said. I know about this of course. It’s not just the sandwich. The death of this young man’s father should have immediately been followed by 13 days of eating food cooked as part of a series of rituals, without salt, and by wearing only white clothes with no seams, and by sleeping on the ground, and by drinking special water, and by not touching any other people, and by daily pujas and bathing. He should have shaved his head. But he was crammed next to me on a floating bus. “I usually talk to him often. I don’t know why we hadn’t talked the last few days,” he repeated. He gazed over the sandwich again to the back of the next seat. “There’s no point in being sad now.” He ate a chip. “I can’t think of what to do.” He offered me more of the sandwich. I asked after the details of how he’d get from the airport to a friend’s house to the bus to his house. It seemed like the only relevant thing to discuss. Everything else was either too small or too big. “So you will be with your mother and siblings by morning,” I said. I told myself that things would make more sense then. I wanted to believe that it would be better when he knew what to do. Over the years, I have witnessed many passages in Nepal. Marriages, coming of age ceremonies, births of animals and people, and deaths of many kinds. The weather itself has a careless drama about it, demanding reverence for the seasons and relentless passage of time…when it is hot, it’s time to plant millet; when there is a full moon, it’s time to fast; when a distant glacier becomes heavy, it’s time for it to break apart, time for the river it lands in to overflow in a torrent, time for an entire village to be swept away. When it is morning, it’s time to get up and cook breakfast. 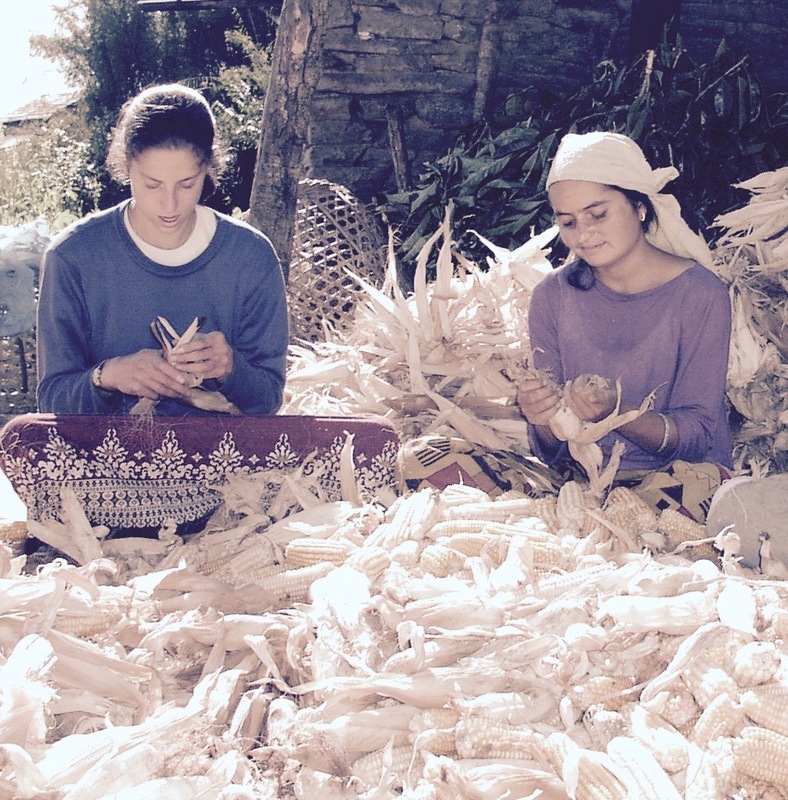 The intimate relationship between people and cycles in this part of the world is one of its most moving qualities. I think it is a hard thing to see if you have always been inside it. But I am outside of it. And peering in, I am endlessly preoccupied with how a single human existence can be subtly accepted as a grand and meaningless expression of a larger constellation of forces and relations and nature, awesome because it is small, not because it is unique. I only notice this because I learned to see myself as separate from the moment I came in to the world. In the West we gain power, intelligence and purpose from our individuality. But it’s something I can’t explain to Aamaa. There simply isn’t a vocabulary to say that my life possesses a greater idea than the idea of the universe itself. I know I’ll never be comfortable with this fact. Instead, I am perpetually drawn to these rites of passage, which integrate our small lives with those of our ancestors, with the cosmos, with God and with the future. Perhaps it’s like continually trickling cool water into a wound that will always burn. This winter I’ve decided to start a project that has been some time in the making. 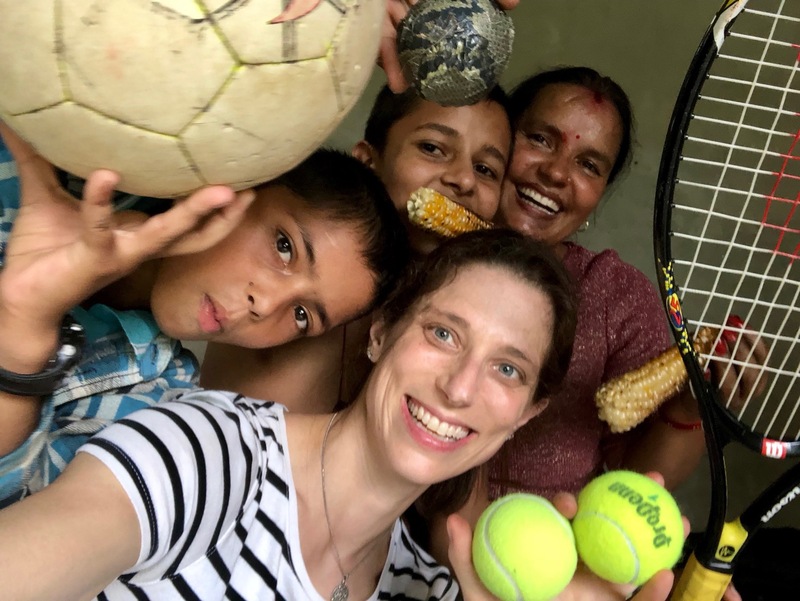 Since I first began coming to Nepal in 2002, young men have flooded out of the country for migrant labor in gulf countries; last year, over 300,000 people left for that purpose alone. A surprisingly large number of these young men die abroad, and when they do, normal mourning rituals are turned completely upside-down. Many of the essential features of customary mourning become impossible. My project will document the way that families have adapted ritual grieving when their sons die overseas. Nepal’s funerary customs in the weeks that immediately follow a death are called kriya. There is great intelligence and beauty in these rituals, which provide a structured role for the community and extended family in sharing grief, reaffirming ties, and placing the life and death of the deceased in to a coherent cosmic story. Many aspects of kriya are austere and demanding, putting physical and mental purification above comfort, and imposing isolation as a sanctuary for the emptiness that follows loss. When the kriya period ends, other rituals last weeks, years, and in some cases, forever. Aamaa, a widow since age 23, hasn’t worn red in 35 years. Anyone who meets her can immediately know without a word that she is widowed – if they are attuned to this custom. Stories of grief and loss in other places have immense importance for us. Ritual grieving in American culture is increasingly short-lived and mainly the private domain of the bereaved. Death as a matter of politics or policy or violence is in our media every day. But mourning, the outward expressions by which we integrate death in to the un-ended lives of the living, seems to be on the periphery of our inquiry, at best. In some ways, mourning is treated as an obstacle to our collective concern with affirming and carrying out our individual significance. But mourning is a choice we make to ascribe meaning to our grief. It is a willful sanctification of our mortality. We hope for the grace to extract from this some kind of redemption, something beautiful about life. Or perhaps simply the courage to keep living. In the course of this series, I hope to honor the beauty of Nepal’s kriya traditions, as well as a generation of young people caught in the ambiguous place between a world that has shattered and one that does not yet exist—at the threshold, in that empty uncertainty, where we are reinvented.